Practicing orthodontics is exciting to Dr. Han because he is challenged every day to see exciting new cases, meet great individuals, see orthodontic progress, and help create beautiful smiles. It is encouraging to work with so many unique people of all ages, from as young as six years of age to adults, and to share their life experiences during this mutual journey of straightening their teeth. Dr. Han attended Johns Hopkins University for his undergraduate degree and continued on to Harvard School of Public Health for his Master’s degree in Environmental Health. His dental education was obtained at Harvard Dental School and he completed his Orthodontic Residency at the University of California, Los Angeles (UCLA). 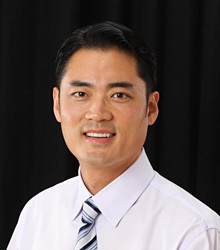 Dr. Han has been happily practicing in the wonderful Vista community since 2003. Continuing education is an integral part of maintaining a successful orthodontic practice. It is Dr. Han's goal to be up-to-date on all the best and most effective orthodontic treatments to offer his patients. He attends meetings and courses through the American Association of Orthodontists, American Dental Association, the Pacific Coast Society of Orthodontists, the California Dental Association, the San Diego Academy of Orthodontists, and the San Diego County Dental Society. These benefit patients in providing the most updated, cutting-edge, and latest evidence-based approach to orthodontics. Dr. Han enjoys living and working in this great area, and he considers the success of the community to be a personal responsibility. He supports various sporting clubs for Vista and Ranch Buena Vista High Schools among others, and has sponsored the Miss Pride of Vista and Miss Teen Tri-City for the past few years. Dr. Han grew up in the Seattle area years before Starbucks, Nordstrom, Amazon, Costco, Microsoft, and others became such well-known companies worldwide and he has lived locally in Carlsbad, CA, since 2003. He is married and has two lovely daughters in orthodontic treatment. When he's not in the office, you can find him playing golf, tennis, running, fantasy football, and skiing. On this site, you can learn about orthodontists—specialists in the diagnosis, prevention and treatment of dental and facial irregularities. The correction of tooth and jaw alignment results in a healthy, attractive smile that's good for life. Dr Han is an active member of the AAO.